In 1952, Cessna initiated the design of a new five/six-seat twin-engined light monoplane designated Cessna Model 310. The prototype flew for the first time on 3 January 1953, proving in production form to be a popular twin. Of low-wing configuration and with tricycle landing gear, the prototype was powered by the 168kW Continental O-470, an engine developed originally for military use under the designation E225. Its use to power the Cessna Model 310 was one of its first civil applications, early production aircraft having the more powerful 194kW IO-470. An identification feature of the design at that time were the two wingtip fuel tanks, then representing the entire fuel tankage. Production deliveries began in 1954, with steady product improvement continuing year by year. The swept tail came in 1960, the extra rear window in 1961, and now the slanted, sharpened tip tanks giving the 310G a totally updated appearance. The cabin was capable of seating five. It has a loaded weight of 4,830 lb., and cruises at 220 miles over a range of 825 miles. A deluxe version with turbocharged engines, air-conditioning and an oxygen system as standard was introduced in 1966. This was then named the Turbo-System Executive Skyknight being known also for a short period as the Model 320, but later marketed as the Turbo T310. Final versions were the basic Model 310 with 213kW Continental IO-520-MB engines, the structurally identical Model 310II which incorporated a factory installed avionics/equipment package, the Turbo T310 with TSIO-520-BB powerplants and the Turbo T310 II with the same additional equipment fit as the Model 310 II. In the mid-1950s, following competitive selection, a slightly modified version of the Model 310 was ordered for light cargo-liaison duties with the US Air Force under the designation L-27A, subsequently redesignated U-3A A total of 160 were built followed by 36 U-3Bs equipped for all-weather operation, and all were nicknamed 'Blue Canoes'. The 1972 Cessna 310 had an Omni-Vision rear window installed in a slightly enlarged rear fuselage to provide more room for back seat passengers, together with a bigger front windshield, new easier-to read instruments, cleaner panels and detail refinements common to the entire line. On some 310s, with extra wing-locker tanks, the aircraft can carry 203 USG. 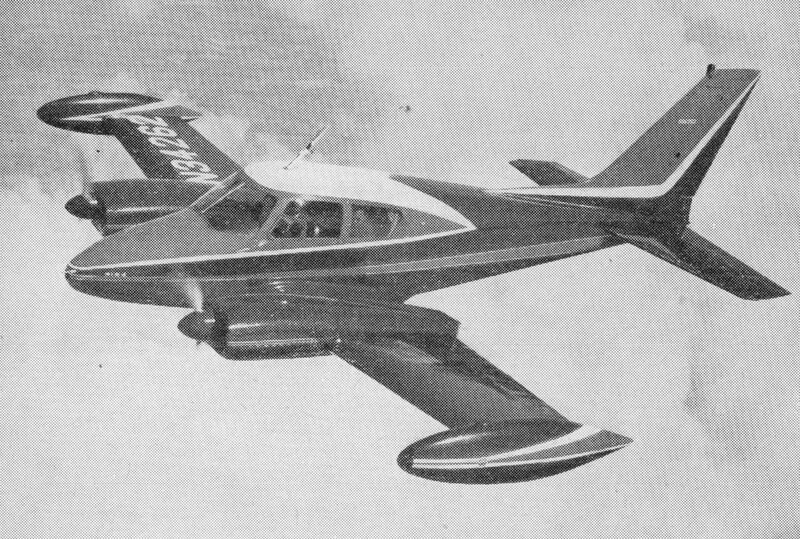 The Cessna 310 had well over 3,000 marketed by 1972. 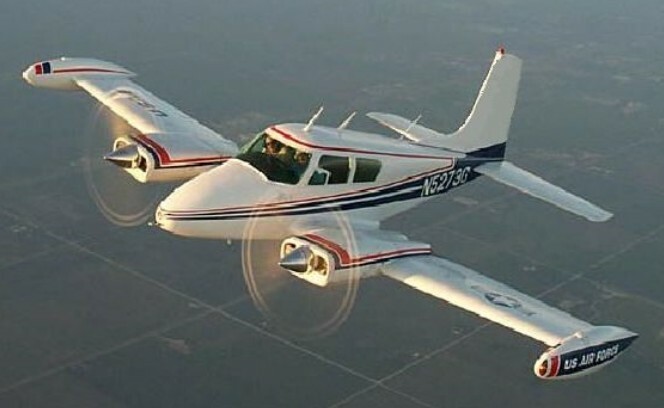 The B55 Barons and the Cessna 310s are powered by 260-hp Continental IO-470-series engines, which have 1,500-hour TBOs, provided their exhaust valves are either nickel-coated or nimonic; otherwise a 1,200-hour TBO applies. With a wingspan of 36 ft 11 in (11.24 m), and two 260 hp engines, the Model 310 can fly safely on only one engine, and has a maximum range of about 1,700 miles (2,735 km). The final development of the 1953 design came in 1975 when a longer nose was fitted as well as an overhead window for the rear seat passengers. When production finished in May 1981, 5,241 commercial examples of the Model 310 had been built, including a small number for the French air force, plus the 196 delivered to the USAF. Engines: 2 x Continental IO-520-M, 285 hp. Equipped useful load: 2049 lb. Payload max fuel: 831 lb. Range max fuel/75% pwr: 1129 nm/5.8 hr. Range max fuel / 55% pwr: 1382 nm/ 7.9 hr. SE ROC: 370 fpm @ 106 kt. SE Service ceiling: 7400 ft.
Min field length: 1790 ft. Engines: 2 x Continental IO-520-MB, 285 hp, 213kW. Max cruise speed: 195 kts. Max usable fuel: 203 USG. Service ceiling: 6020 m / 19,750 ft.
Service ceiling SE: 7,400 ft.
Takeoff dist 50 ft obstacle: 1,700 ft. Landing dist 50 ft obstacle: 1,790 ft.
Max ramp wt: 5,535 lbs. Max zero fuel wt: 4,900 lbs. Max useful load: 2,182 lbs. Engines: 2 x Continental TS10-520-BB, 285 hp. Max cruise speed: 223 kts. Service ceiling SE: 17,200 ft.
Takeoff dist 50 ft obstacle: 1,662 ft.
Max zero fuel wt: 5,015 lbs. Max useful load: 2,062 lbs. Engines: 2 x Continental TSIO-520-B, 285 hp. Equipped useful load: 1933 lb. Payload max fuel: 715 lb. Range max fuel/75% pwr: 1293 nm/5.7 hr. Range max fuel / 55% pwr: 1316 nm/ 7.4 hr. SE ROC: 390 fpm @ 106 kt. SE Service ceiling: 17,200 ft.
Take-off dist, 50ft: 1670 ft.
Ldg dist 50 ft: 1795 ft.
Wingspan: 36 ft. 11 in. Overall length: 31 ft. 11.5 in. Height: 10 ft. 8 in. Engines: 2 x Continental IO-520-E, 300 hp. Max TO wt: 5200 lb. Equipped useful load: 1952 lb. Payload max fuel: 1112 lb. Range max fuel/ 75% cruise: 990 nm/4.3 hr. SE ROC: 400 fpm @ 101 kt. Min field length: 1795 ft.